He’s behind you – oh no he isn’t! 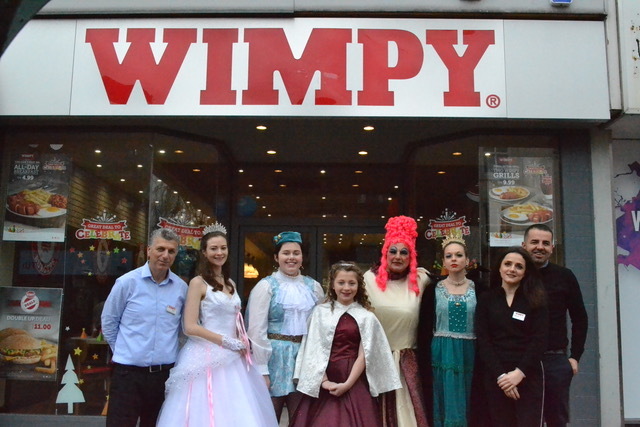 There were fun and frolics galore on Saturday, 13 January, when characters from Avenue Theatre Productions’ Sleeping Beauty pantomime took time out from rehearsing to visit the smart new Wimpy Sittingbourne this week. They were on hand to launch a special art competition for children to win 10 fabulous family panto tickets worth £25 each, to see the panto, which runs from 14-17 February. To be in with a chance of winning, all youngsters have to do is draw a picture of their favourite character(s) or a scene from the classic fairytale, which tells the story of a beautiful princess, a sleeping enchantment, and a handsome prince. Entry forms are available in the restaurant and there are two categories, one for under eights and one for 8-12-year-olds. The closing date is 31 January and panto cast members will be helping to judge, with the winners will be announced shortly afterwards. Wimpy Sittingbourne opened its doors for the first time just before Christmas and franchisee, Adnan Etemi, said: “The response from residents has been fantastic and we’re delighted to be here. The competition is free to enter and requires no in-store purchase. Five winners from each category will be chosen and will each receive a family ticket for four people to attend the afternoon show on Saturday, 17 February.